Some of the questions that appear early in each part of the SAT Chemistry Subject Test will ask about the basic properties of matter and how they're measured. In this chapter, we'll review some basic terms: mass, volume, density, pressure, energy, temperature, and specific heat, and we'll show you how to approach the sometimes scary looking questions that cover these topics on the exam. Think about a sample of any type of matter, whether it's a hunk of solid, a glass of liquid, or a container of gas. The mass of any of these samples refers to the amount of matter in the sample, while matter simply refers to anything that occupies space and has mass. Mass is measured in grams. One gram is nearly equal to the weight of a paper clip—;for heavier samples it's often more convenient to use kilograms (1 kg = 1,000 grams), while for very small samples, it's convenient to use milligrams (1 mg = 1/1,000 gram). For any particular substance, a sample of greater mass means a sample with more atoms or molecules in it. (For now, think of atoms and molecules as tiny pieces of matter. We'll talk more about them later.) Two different samples of the same substance that have different masses must be made up of different numbers of atoms or molecules; for example, ten water molecules have greater mass than seven water molecules. Eight carbon dioxide molecules have greater mass than four carbon dioxide molecules. To convert grams to kilograms, just move the decimal point three places to the left. To convert kilograms to grams, move the decimal point 3 places to the right. To convert grams to milligrams or liters to milliliters, move the decimal three places to the right. To convert milligrams to grams or milliliters to liters, move the decimal point three places to the left. For the SAT Chemistry Test, there's nothing more you need to know about mass itself. It represents the quantity of matter that makes up a sample. It's usually measured in grams, kilograms, or milligrams. Again, suppose we're thinking about a sample of matter—;solid, liquid, or gas. When we say volume, we're talking about how much room the sample takes up in space. The SAT Chemistry Test usually measures volume in liters (L) or milliliters (mL; 1 mL = 1/1,000 L—;also keep in mind that 1 mL = 1 cm3, or cubic centimeter). How a sample is measured depends on what state it's in—;whether it is a solid, liquid, or gas. When the sample is a liquid, we can determine its volume by pouring it into a graduated cylinder or any other measuring flask. If the sample is a solid, we can immerse it in a liquid and see how much liquid it displaces. In other words, we can compare the original volume of the liquid and the volume of the solid/liquid combination, knowing that the difference will be equal to the volume of the solid. For samples of gas, the volume of the gas is always equal to the volume of its container, since a gas always expands to fill its container. How do we learn the volume of the container? Well, if the volume isn't marked on the container, we can just treat the container as a solid object and find out its volume by immersing it in a liquid. The property of density is intrinsic to a substance; substances such as water, lead, carbon dioxide, or ethyl alcohol, for example, all have different densities. Density is a measure of the ratio of an object's mass to its volume. Generally, if we say “water is heavy,” we mean that water has a high density relative to other substances. Ten kilograms of water occupy a relatively small volume—;about 10 L. When we say “feathers are light,” we mean that feathers have a low density relative to other substances. Ten kilograms of feathers occupy a relatively large volume. All this means is that every 1 mL of substance X weighs 4 grams, and every 1 mL of substance Y weighs 3 grams. So, for this example, 5 mL of X weighs 20 grams, and 15 grams of Y occupies a volume of 5 mL. At a given temperature, a certain mass of a substance that is a solid or a liquid has a fixed volume. This means that for liquids and solids at a given temperature, density does not vary. The same is not true of gases. A sample of any gas will expand to fill its container. We can double the volume of the container without changing the mass of the sample of the gas, and the density will decrease by a factor of two. When test writers say “pressure,” they are usually talking about (1) the force that a sample of gas in a closed container exerts on the container walls, or (2) a solid or liquid standing in an environment and the force that a gas is exerting on the walls of the environment and everything in it—;including the surface of the solid or liquid. So, what units do we use to express pressure? A few. There are torr, millimeters of mercury (mmHg), and atmospheres (atm): 1 torr and 1 mmHg are equal, and 760 torr (or 760 mmHg) = 1 atm. What instruments are used to measure pressure? The barometer and the manometer. Both the barometer and manometer involve the use of the liquid metal mercury (Hg) to determine atmospheric pressure. Any question on the exam that contains any of the above terms will in some way be concerned with pressure. So when you see such a question, think pressure and you'll be on the right track. You will have to know a few things about energy for the SAT Chemistry Subject Test. First, remember that energy exists in different forms, but is always defined as the ability to do work or transfer heat. Energy can exist as heat, light, kinetic energy, or chemical bond energy. When we say kinetic energy, we're talking about the energy that an object possesses by virtue of the fact that it is moving. A moving bus, train, or car has kinetic energy. When we deal with chemistry, we're usually thinking about molecules that move; moving molecules have kinetic energy. The faster molecules move, the higher their kinetic energy. What units are used to describe energy? One calorie (1 cal) is equal to slightly more than 4 J. What instrument is used to measure energy? • Kinetic energy is the energy contained in the movement of molecules. The greater the kinetic energy, the faster the movement and the higher the temperature of the molecules. • Chemical bonds contain energy. Breaking bonds requires energy; forming bonds releases energy. • Heat is the transfer of kinetic energy from one thing to another. • A calorimeter measures energy. What exactly is heat? When you touch something warm, you feel heat, but what is that? Technically, heat is defined as the flow of energy from a body at a higher temperature to one at a lower temperature. If a particular sample of a substance experiences an increase in temperature, then you can say that particular sample has experienced an increase in heat content. So what exactly does temperature measure? Temperature measures the average kinetic energy of molecules in a sample; as the molecules in a sample move more quickly, the temperature of that sample increases. For certain substances, the addition of a large amount of heat will have only a small effect on their temperature, while for other substances, the addition of a small amount of heat will have a dramatic effect on their temperature. The heat capacity of a substance refers to the amount of heat it must absorb for its temperature to be raised 1°C. Different substances have different heat capacities, and the heat capacity of a substance is described by its specific heat. The specific heat of a substance is the heat capacity of 1 gram of the substance. Here's an equation that puts together all of the terms we just reviewed. For example, it takes 1 calorie of heat to raise the temperature of 1 gram of water by 1°C. 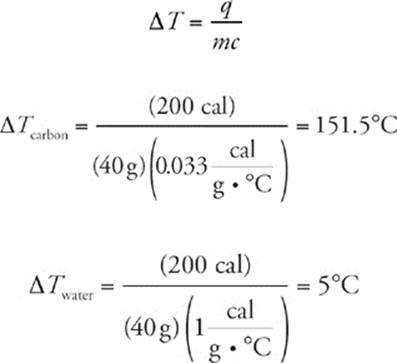 So we say that the specific heat of water is 1 cal/g • °C. The specific heat of carbon is 0.033 cal/g • °C, so it takes 0.033 calorie to raise the temperature of 1 gram of carbon by 1°C. Now suppose you take 40 grams of water and 40 grams of carbon and add 200 calories of heat to each sample. Because water has a significantly higher specific heat than carbon, the input of the same amount of heat to both samples will result in a greater increase in temperature in the carbon sample than in the sample of water. See the calculations below. Carbon increases in temperature by 151.5°C, but water increases in temperature by only 5°C. Why? Because the specific heat of water is roughly 30 times that of carbon. Similarly, if we have equal masses of water and carbon and we want to raise the temperature of each sample by the same amount, we'll have to put about 30 times more heat into the water than we have to put into the carbon. We've been talking about temperature in °C, and when we think of specific heat, that's the right unit of temperature to use. But, for this test, you also need to know about another temperature scale: degrees Kelvin (K). The Kelvin scale is also called the “absolute temperature” scale. How do you convert °C to K? And remember, when it comes to heat content, temperature is a reflection of, but not a direct measure of, heat content. Heat content is not measured in °C. It's measured in calories, joules, or kilojoules. The SAT Chemistry Test writers sometimes make their questions look more difficult than they are by trying to catch you off guard and steer you off course. They might, for instance, use camouflage and temptation traps. Try the ten subject test–type questions that follow, keeping the techniques from Chapter 2 in mind. You can find the answers to the following questions in the beginning of Part III. Questions 1–4 refer to the following. 26. Two solid objects are of equal volume, but object A has density = X, and object B has density = (0.5)(X). Which of the following is true concerning objects A and B? (A) Objects A and B are of equal density. (B) Object B has twice the density of object A. (C) Objects A and B are of equal mass. (D) Object A has one half the mass of object B. (E) Object A has twice the mass of object B. 38. Ten grams of oxygen gas are in a rigid 5 L vessel. If 2 g of oxygen gas are added to the vessel and temperature is kept constant, which of the following characteristics of the gas will increase? · Mass is a measure of the amount of matter in a sample and is measured in grams or kilograms. · Volume is the amount of space something takes up and is measured in cubic centimeters, milliliters, or liters. · Pressure is force per unit area and describes how much a sample of gas or liquid pushes on the surfaces the sample is in contact with. · Standard pressure is 760 mmHg = 760 torr = 1 atm. · Atmospheric pressure is measured with a barometer. Pressure in the laboratory is measured with a manometer. · Energy is measured in calories and joules, where 1 calorie = 4.186 joules. · Chemistry is concerned with two types of energy: Kinetic energy is the energy of motion of molecules, and bond energy is the energy stored in a chemical bond. · Temperature is measured in degrees Celsius and Kelvin, where K = 273 + °C. · Specific heat is the amount of energy required to raise the temperature of 1 gram of substance 1 degree Celsius.